S Ramadorai has spent 32 years in Tata Consultancy Services, becoming its CEO in 1996, taking it through a successful listing last year and playing a key role in turning it into a $2-billion Asian software leader. His alma maters include Delhi University, Indian Institute of Science, Bangalore and University of California in Los Angeles. How do you propose to meet expectations for high growth as your base is quite high? We have been doubling our revenue every two-and-half years, irrespective of the base. The fundamental requirements are how fast you run and how focused you are. So despite the size, a fast pace will have to be maintained? We have no choice and we will maintain the pace. You had set a goal for TCS -- becoming one of the global top 10 by 2010. What is the current status? I think we are somewhere in the 13th position and, hopefully, by 2010 will be in the top 10. More importantly, the top 10 would include profitability, predictability and consistency of delivery. This means driving quality and performance, managing attrition, communicating your goal, what do you stand for, and how your clients relate to you. TCS is a solutions organisation, not a resourcing organisation, with the right engineering attributes. We stand for engineering attributes in any system to be delivered, like for the National Stock Exchange, the Canadian depository, custody application for Standard Chartered Bank, and so on. Is TCS slightly better than the industry when it comes to attrition? Our attrition rate for last year was 8 per cent, compared to Nasscom's average for the top nine companies of 15 per cent. TCS imparts technical, quality, project management and domain competency and some soft skills. The second dimension is the nature and type of projects that challenge young minds, engaging them intellectually to contribute to the well being of a project. Third is the personal mentoring that takes place. And then, of course, the compensation and excitement of being in different parts of the world. What is fast-growing compensation doing to cost competitiveness? Costs are going up. The compensation is also undergoing a change. It is a differentiated compensation depending upon the competency you have, and secondly, a variable compensation based on the actual performance. 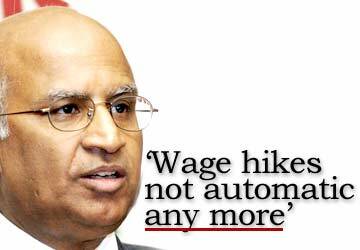 Wages are not automatically increased every year for everybody to get an increment. We have got out of that model quite a while ago. Any change to the basic salary is purely inflation related. How are you addressing the task of going up the value chain, raising productivity? In order to differentiate, the next wave is going to be about how much of innovation there is in the output -- in R&D, tools, processes, methodology and business models. Also, how do you address issues such as offshore, onshore and global delivery. We address it through innovation in R&D at our corporate R&D centre. There is a very strong productivity improvement initiative, tools building and automating some of the software processes. How does TCS fare in its ratio of fixed price engagements to time and material ones? TCS has a higher ratio of fixed prices contracts in comparison to the competition. Fixed price contracts suggest more complex and mission critical end-to-end engagements. So we are encouraging our clients to move near-shore, thereby leveraging our wide network of global development centres, before eventually moving work off-shore to India. The industry faces a price challenge. Any service that gets commoditised will always be under price pressure. You have to be very competitive but at the end of the day nobody will dump you unless you have no solution capability. They may pay a certain premium, but having given that premium, they expect the output. Years ago, TCS brought out Product EX. When will the country make packaged products which even the man in the street recognises? The industry and TCS have started looking at products in a big way. We have certain core products in the banking and insurance and telecom space, and we are continuously developing products as an enabler for the overall solution-building. We are licensing tool sets for model building or analysis, and testing. In the future, we may even license these products directly from within TCS or create a business unit with a product focus that runs like a separate company. Do you have a target like 1 per cent of revenue from license fee by. . .
A business unit must be profitable and measured by performance in terms of P&L and EVA [economic value added]. But its growth must benchmark with the units in the corresponding industry rather than TCS alone. How has life changed after listing? There are more demands on my time now. We have to meet with financial as well as technology analysts. You've got to meet a lot more with the media, spend a lot of time with the brand- or image-building of the company. At the end of every quarter, six months and year you have to do road shows in terms of attracting capital into the company. Then there is the time needed to connect with your customers, which should be the primary responsibility. Listing keeps you on your toes. . . but there is also the tyranny of quarterly results. Overall, we are extremely happy we listed because it brought in a dimension of visibility and responsibility. From one investor, now we've got multiple, over seven lakh investors. That's the good thing, the responsibility, the sharing of wealth and making sure your employees are part of that wealth creation and sharing. The problem situations are, even when we don't give a guidance, we will be measured on a quarterly basis. Even though we might want to be measured on a yearly basis, two-year basis, on our sustainability, in terms of doubling every two, two and half years, without compromising profitability, they want to look at micro dissection. Having listed, we have to accept both the good and the bad and perform. TCS is the most globally multi-centred Indian company. What are the challenges and advantages? The biggest advantage is you can deliver solutions across the world, which relates to markets very effectively. Customers see this as a very clear value differentiator. Whether it is in Uruguay or Budapest or Melbourne, customers want localised support as well as the ability to scale up wherever it is needed. Second, we have localised the workforce enormously. Third, is addressing how to integrate them with the organisation, be it training, best practices, sharing project management capabilities or quality consciousness. You can achieve that only with time. The cons are the challenges in building excellence. The next wave will be to expand these overseas locations. That becomes a challenge because you need to scrutinise these people. We are seriously considering a GRE type of evaluation of these people. About two or three years ago, we conducted an all-India entrance test. Now the point is, can we extend that model but have an external certification agency? We are championing this idea through Nasscom also. Once this test is certified, it can be applied all over the world. There is a perception that in the short term, offshoring to India improves margins. But if you have centres everywhere that challenges margins. Yes, but it also gives you the ability to grow. So the balance is between growth and margins. Growth with margins is the theme. If the business needs a presence in Hungary, then it's a must. Otherwise, those companies may not do business with you at all.